Have you ever looked for just the right handbag to go with a favorite outfit and shoes, only to settle for something different than you hoped? I have a solution for this dilemma. 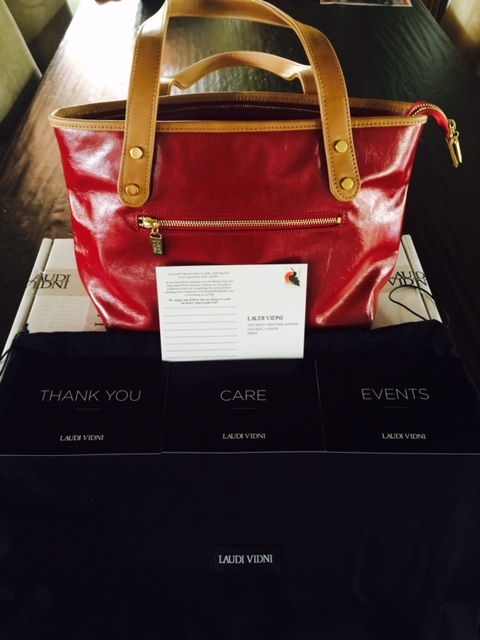 I recently learned about the handbag manufacturer Laudi Vidni from a gift card inside the 2016 Madison & Mulholland Awards Season Gift Bag. Viewing the Laudi Vidni online, I found it surprisingly informative and easy to use with prices starting at $75 for a custom designed bag. With 26 styles from wallets and wristlets, clutches, small bags to cross bodies, totes, shoulder bags and backpacks to choose from, you can then personalize your bag in three fun steps. First I made the decision to start working on a leather Fermata Tote with a zipper closure. My inspiration was a bright red Kate Spade handbag that a good friend wears stylishly. After selecting the bag style, I went to the leather types page, which has about 46 different colors ranging from smooth everyday to interesting patterns. All are tanned in the U.S. or Italy. 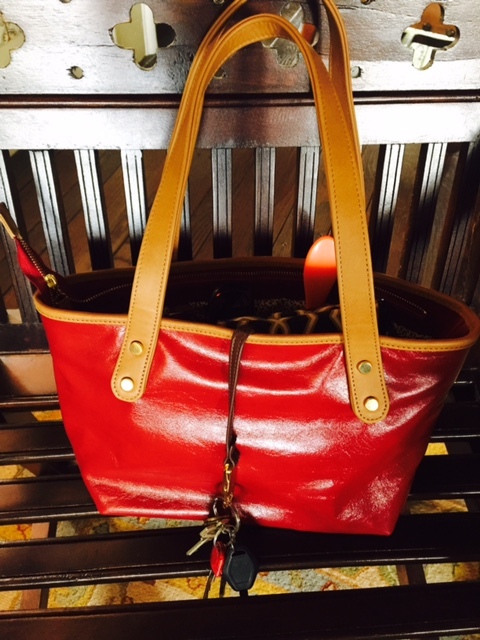 To make a red handbag, I had three choices: Soft Grain Cayenne, Croco Rouge, and Soft Metallic Ruby. I chose Soft Grain Cayenne. Next, I had to pick a color for the straps. With 33 different colors of leather, I chose the pretty Soft Grain Camel. I selected the same color for the binding. Then I went to the lining page. With eight different fabrics from solid colors to animal print, I clicked on brown spotted that gave a leopard look inside my red bag and matched the camel straps and binding beautifully. Lastly, I selected hand-brushed gold hardware to compliment the rich Camel and brown spotted lining. They also offer silver hardware. It’s great to see each step in the creation of a custom bag. For ten dollars more, they offer to monogram the inside. Laudi Vidni stands behind their product 100% – When you click on purchase, a box with hearts states, “If you don’t love your bag for any reason, we will take it back”. They guarantee it. Another box says, “Want an expert opinion? Call us at (773) 697-7847 to speak with one of our handbag experts”. That is helpful if you aren’t confident in your decisions. My order was sent to their Chicago workroom to start handcrafting my bag with care, based on my specifications. It took three weeks from the day I ordered to receive my handbag. During the waiting period, I received email updates of when they started working on my bag, when it was finished, and when it was shipped and delivered to my door. 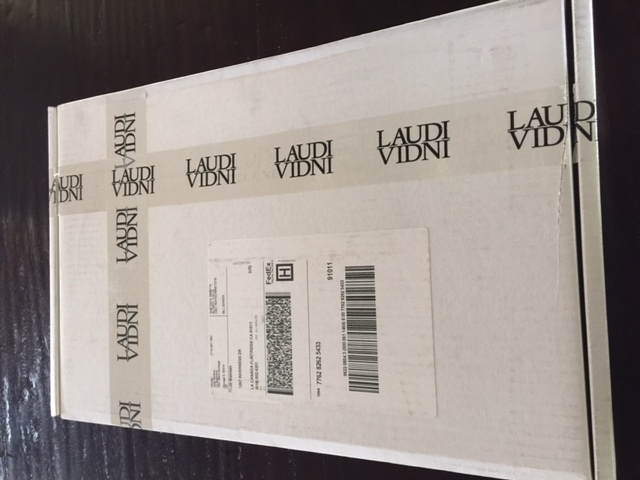 My bag arrived in a big box and was beautifully packaged with Laudi Vidni tissue paper and stickers. Inside a soft velvety black bag held my new purse. There was also a black envelope with my name, Jill, in gold handwriting. Inside were four postcards: a thank you card signed by Laura Kofoid; a Care card on caring instructions for the leather; an Event card informing me how to host a Corporate Event, and purchase Client and Employee Appreciation Gift Cards. The last card was a stamped postcard to provide feedback and comments to the team at Laudi Vidni. As I looked at my classic Fermata Tote, I LOVED it. Who knew I was a purse designer? My bag is perfect. It’s big enough to carry all my daily essentials, plus an iPad. The exterior and interior have a zip pocket, and inside are two open pockets that are ideal for organizing my cell phone, business cards or favorite lipstick. There is a signature Laudi Vidni key clasp to easily find my car and house keys. It’s handcrafted with the highest attention to detail, and best of all, it was made in the USA. Is it as cute as my friend’s Kate Spade bag? Yes, and I have the satisfaction of designing it myself. When someone comments on where I bought my handbag, I tell them the story above and give them the online link. Want to make your own purse? If you are in Chicago, they have a Laudi Vidni design studio at 1007 West Armitage Avenue in the historic Lincoln Park neighborhood. Inside, they will help you build a gorgeous bag and offer you champagne on ice. If it helps you, they will ship bag samples and leather swatches to your home or office, at no cost or obligation to you, or you can go online and get started like I did.